How served: 750ml corked and caged poured into my La Chouffe tulip glass. I paired this beer with: Roquefort cheese and a hard Italian salami. 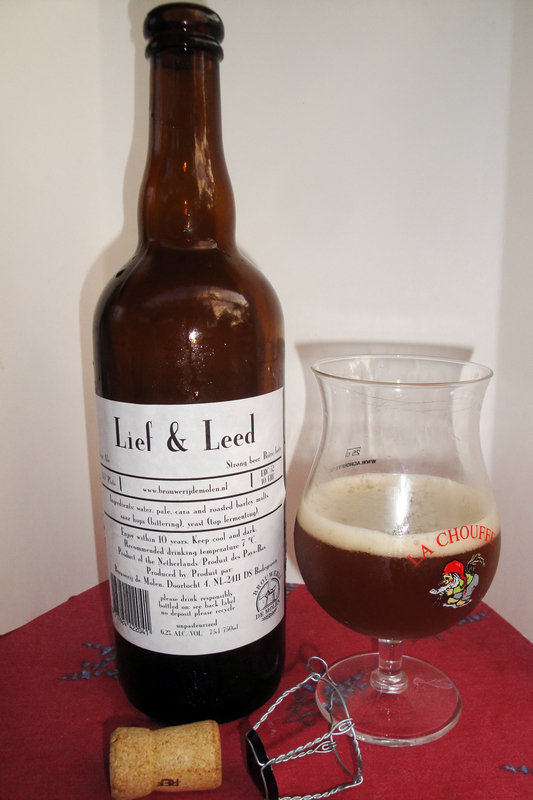 The 1st time I tasted this beer was on tap during our tour at Brouwerij De Molen in October 2012. My initial impression was that of a souped-up Rodenbach Grand Cru (Flemish Red Ale). I liked the beer so much at that time that I purchased a few bottles to bring home, including to one I’m having now. Can’t wait to return to De Molen in October were we will be having a tour of the brewery as well as a beer paired dinner! This beer poured a hazy brownish-orange with a 1 finger off white head which left a thin lacing on my glass. The nose included berries, leather, woody, funk and barnyard aromas with a hint of sweet and sour. The taste of this brew starts off tart with some sweetness to balance it out. Like with the nose, I picked up some berries/cherries as well as some woody notes. The tartness and funkiness of this beer made you feel very refreshed and wanting more. It finished on the dry side. The body was light to medium light and had a low level of carbonation level. . The drinkability was very good especially with what was paired it with. It will be interesting to see what a few years of aging on my other bottle will add to this beer. Sour Ale. Strong beer/Bière forte. Ingredients: water, pale, cara and roasted barley malts, saaz hops (bittering), yeast (top fermenting). Enjoy within 10 years. Keep cool and dark. Recommended drinking temperature 7° C.
Product of the Netherlands/Produit des Pays-Bas. Brouwerij de Molen, Doortocht 4, NL-2411 DS Bodegraven. From their website: Nothing here on this beer.